The repeated rainy days left lots of mud and swamps around, and the frogs are celebrating. 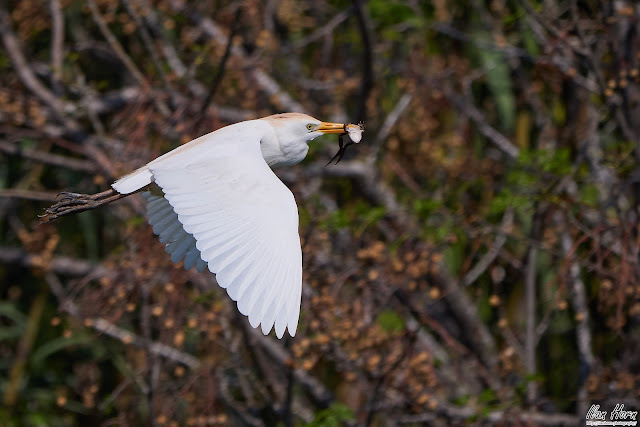 Also celebrating are the Cattle Egrets, which turn out to be quite capable frog catchers. Here we have a photo of a Cattle Egret in flight after having caught a frog. Time for lunch? What do I like about this photo? It shows nature at its best, nothing filtered, in an awesome position. The bright white Egret stands out against the darker background, and the frog is clearly visible at the tip of its beak. I used a fast shutter speed (1/2500 of a second) to freeze the action, and an open aperture (f/6.3 - the most open my lens supports at the focal length of 400mm that I used) to have a shallow depth of field, so the Egret and frog are in focus, but the background is blurred. What would I want to improve? An even more open aperture would blur out the background even more, which would be a plus here since it's a bit noisy.